Bring all new flavors to your specialty drink menu with this Torani butterscotch flavoring syrup! This tempting flavor will complement your beverages without overpowering them or being too sweet, while the user-friendly bottle will be convenient for your busy baristas to use. Torani flavoring syrups are specially formulated to resist curdling in milk and to hold up well under heat, making them the perfect choice for espresso-based drinks, brewed coffee or tea, and more. Use it for frappes, iced coffees, smoothies, and even baking! Oh my goodness. I love this butterscotch flavor. It tastes just like the little candies my grandma always had. Brought back some really good memories. I like all of the other Torani flavors that I've tried, but this one just doesn't taste like the Butterscotch I was expecting, and customers say the same. This is not good. Tastes fake and processed. Would not recommend. Very strong taste. Save your money and choose a different option. Torani has tons of flavors. Bought this flavor along with many others, this is probably one of my favorites.I mostly use it for milkshakes and for iced coffe and it makes it taste great! Prices here are killer compared to other places. You have to love this butterscotch flavoring!. The smell hits you immediately when you add it to any drink and the flavor doesn't miss. Mixes in well. Torani really outdid themselves with this amazing flavor. It is rich and buttery and when I taste it it reminds me of those butterscotch candies! A very "on point" flavor and is not fake or overly sugared. This is a very true-to-name flavor. If you like butterscotch, you will definitely love this syrup. The high school football team that frequents my coffee shop have taken a liking to the Butterscotch Macchiato. I use syrup for drissel as well as base. Our customers love Torani flavoring syrups. The Butterscotch flavor is delicious and blends well into creamy thick milkshakes and sweetens hot, cold, or frozen coffees. If you love butterscotch you will love this torani syrup. It has a great flavor and strong enough that you don't have to use a lot of syrup. The Butterscotch flavoring syrup has a good flavor in the lattes and even in the hot chocolates. I would highly recommend this flavor to anyone. The Torani butterscotch flavoring syrup is so rich and buttery. A great flavoring for my coffee and especially great around the Christmas season. So pleased and impressed with this syrup. I love the sweet saltiness of butterscotch flavor. Add it to your coffee and you're in for a real treat. Then top it with whipped cream and caramel sauce. Warm, buttery, and sweet, this coffee syrup is really a winner. It's got a strong smell but it definitely smells like something you'd want to eat. I personally love this torani flavoring. My customers use it in their hot coffees and can't get enough of it. I never seem to buy enough of it ! Forget the Caramel or Butter Rum flavors, because if you're looking for if you want something warm & complex, but delightfully sweet, than this is the one for you. This is incredibly sweet, not too sickeningly sweet like the aforementioned flavors and the flavors are balanced very well. A little goes a long way with this flavor, and every sip, slurp, or bite's heaven. The smell of this syrup alone will be enough to make you want to drink it by itself. It would taste amazing in a milkshake I think. This is a VERY fragrant butterscotch-flavored syrup. It almost smelled like it had a touch of rum in it! Once painted on the inside of a French macaron, the flavor melded beautifully with the almond scent and compliments the whole ensemble. I was afraid it would be overwhelming but thankfully that wasn't the case. I'm sure it would be great added to sauces and syrups, ice creams, or anything else you want to give a hint of butterscotch to. The Butterscotch Syrup in a Butterscotch iced latte is amazing. We keep it in always in stock, and we love it. We will always have it. Tastes very strongly of butterscotch flavor. Can add a lot of richness to coffee drinks with skim or reduced fat milk instead of whole milk. This Butterscotch flavoring by Torani has brought a new level of flavor to our menu here at the Express-O! We have been very happy with the way it satisfies the taste pallets of our happy customers! Great flavor to have on hand especially if you have a coffee shop. There are a number of drinks that can be made with butter scotch especially when you mix it with other flavors. I love this flavor because it's not too strong and does not taste better when used. This has a great, buttery butterscotch flavor that works great in a cold brew espresso beverage (think a latte). Definitely please with this one and it's going to go over great with customers. Butterscotch icecream is one of my favorites, but is so hard to find. Our family makes a lot of homemade icecream, so we decided to give this a try. It's delicious and tastes just like the icecream I used to have as a kid. This butterscotch flavoring syrup is one of the more popular flavors for my customers. We use it often to add a bit of flavor to Macarons and this one sells out first! Smooth buttery flavor. It's very popular in our shop and sells fast and tastes just like candy. Goes surprisingly well with fruity flavors too. Customer favorite! I had a recipe for butterscotch moonshine I was wanting to try but could not find any butterscotch extract that I liked. I emailed the company that produces this product and they advised it should work in lieu of the extract, just triple the amount. So I ordered this and am so glad I did. This produced some fine tasting spirits and my friends and family love it. I'm sure I will be ordering it in the future. This is very good, i added it to my vanilla carmel latte coffee drink for a unique twist in flavors and it was awesome tasting! The butterscotch flavoring syrup is wonderful. A latte topped with whipped cream drizzled with butterscotch ice cream syrup tastes like a dream! Throw on some nuts and its like a sundae! We made Harry Potters butter beer with this stuff!! It tasted fantastic and the kids loved it. Smells and tastes awesome. Great price definitely recommend the product! We like this. We make a great butterscotch coffee out of this stuff. I wish it was a little more butterscotchy though! But we love it overall! 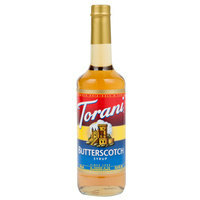 We just recently ordered the Torani Butterscotch syrup but we really enjoy the rich butterscotch taste. Our customers love it in blended Chai's as well! The Torani Butterscotch is a delicious, versatile flavor especially useful in ice cream based espresso drinks or baked goods. Always good to have on hand. This product has a special place in my heart as it brings me back to my childhood. I like to use it in my hot chocolate or over a bit of vanilla ice cream. I love the Torani Butterscotch syrup in my morning Latte. I add about 1 oz of syrup to my steamed milk and espresso to make a deliciously smooth drink! Butterscotch is a popular flavor for us and the customers love it. Torani syrups do not have any bad or fake tastes to the products. It is great mixed into a drink or to make a batch of yogurt! Taste just like the real thing! the suggested serving size was a little too sweet for me, so I cut it down by half for a 12 ounce serving and it was perfect. Will definitely be ordering more soon! This syrup is delicious by itself in a latte or mixed with other syrups such as caramel or white chocolate. It has become a staple at our store. This Torani butterscotch makes excellent lattes and butterfinger mochas. Everyone who is adventurous enough to order loves it! It is the perfect flavor to combine with caramel or chocolate. This is a wonderfully flavorful product. What a great value! We will probably purchase more when we run out, but this should last a while. This item is great when mixed with hot cider. Customers love it and the price is a great price turnover. This syrup also has no aftertaste. I order a case of this product, it arrived to my location all busted up exterior box was all taped up. I contacted customer service sent them pictures of the box and the case inside with all the broken bottles, they gladly sent me a brand new case to replace the damaged one. Very professional customer service help.